The Marine & Materiality Art Exhibition, which is running in conjunction with the Bermuda Economic Development Corporation’s St. George’s Marine Expo 2018, is set to open on Sunday, April 15th – for one day only. A handful of Bermuda artists will display their works in the one-of-a-kind exhibit, including: Louisa Bermingham, Carla-Faye Hardtman, Teresa Kirby Smith, Andrea Sundt and Ami Zanders. It will be open to the public on Sunday from 11am until 6pm – the same time as other Marine Expo activities – in the Bermuda Yacht Services Headquarters at Ordnance Island, St. George’s. 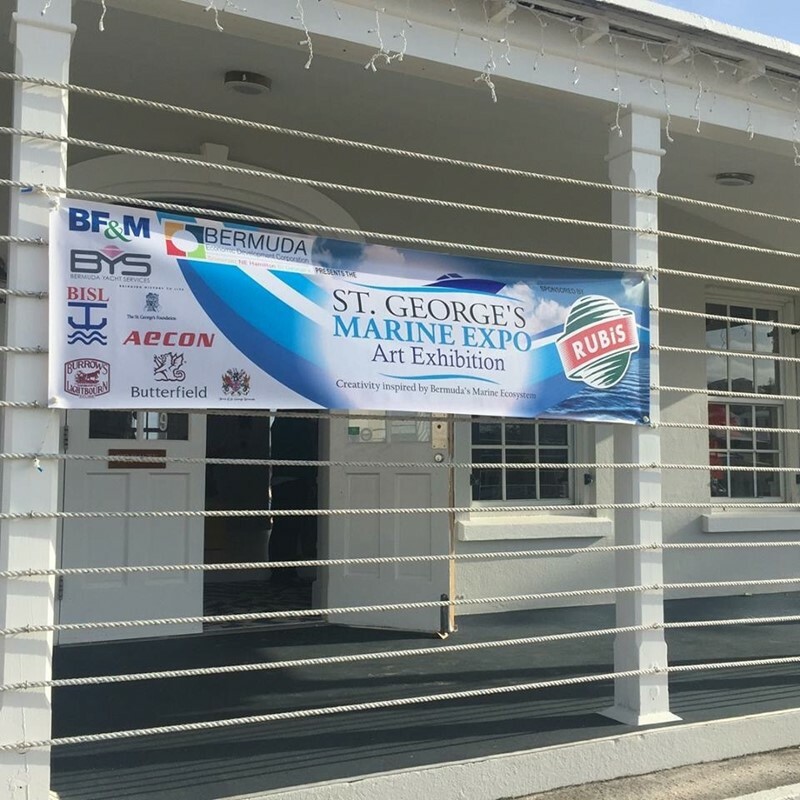 Raymond Lambert, BEDC’s Economic Development Officer for St. George’s, said: “For the first time ever, we decided to include an art exhibition in this year’s offerings for the St. George’s Marine Expo 2018. The BEDC recognizes that artists are also entrepreneurs and saw this as an opportunity for us to grow the event by adding an interesting, new component. Mr. Lambert said he was hopeful art lovers would pay a visit to the Marine Expo on Sunday to check out this one day only show. Sponsored by RUBiS Energy Bermuda, along with many other community partners, the event will feature entertainment, demonstrations, races and a variety of vendors showcasing marine products and services. Last Friday, April 6th, special guests and dignitaries, including Minister of Economic Development and Tourism, Jamahl Simmons, attended a special reception at the St. George’s Marina and were given an early glance of the works to be displayed this weekend. Lisa Howie, Independent Curator for the Exhibition, said, “We had a warm reception on Friday night with a diverse group of art supporters, many of whom were surprised by how the marine theme had been repurposed as an art gallery. For more information on Sunday’s even, call 292-5570 or email info@bedc.bm. Louisa Bermingham is a teaching artist who studied her BFA, Textile Design and MFA, Teaching, Visual Arts, at the Rhode Island School of Design. She has exhibited extensively on island; was featured in the 2010, 2012 and 2016 Bermuda Biennials at Bermuda National Gallery; and has had solo exhibitions at Masterworks Museum of Bermuda Art and the Bermuda Society of Arts. She has also exhibited before in New York. Most recently, she exhibited at Bermuda College’s art gallery with creative input from her two children. Carla-Faye Hardtman has studied Garment Making in Barbados and Occupational Studies with a specialisation in Fashion Design in New York. She also has a BFA in Visual Communications and BA from a school in London. Her love for art and design and 3D forms has led to an interest in paper cutting art, fashion and graphic design. As an emerging artist, Hardtman is looking for new art ventures. She first shared her paper cutting skills as an entry for the Charman Prize 2017 at Masterworks Museum of Bermuda Art. Teresa Kirby Smith was born in Peru and raised in Chile, Panama and Argentina. She attended university and art school in the United States, lived in New York City and, for an extended time, in London. She now resides permanently in Bermuda. Her work has been included in the 2012, 2014 and 2016 Bermuda Biennials at Bermuda National Gallery. She has exhibited in the Charman Prize exhibitions at Masterworks Museum of Bermuda Art and was the Grand Prize Winner in 2013. Andrea Sundt lives and works in Bermuda. She is a New York and Bermuda based artist and costume designer with a background designing for theatre and film. Raised in Oslo in Norway, Sundt received her design degree from Esmod Paris in 2007, followed by a BFA in Fine Art from Parsons School of Design in New York in 2014. She has exhibited in several group shows in New York and Bermuda, with her ongoing series of large scale paper installations. Her latest design work was creating costumes for Maternal Secrets [a piece directed by Lucinda Spurling], which was entirely shot in Bermuda. Ami Zanders is an honours graduate of the International Fine Arts College and Kean University. Zanders draws inspiration from her childhood to explore various themes using diverse mediums, such as silkscreen, intaglio, weaving, painting, paper making and metal work. In 2010, Zanders won the Charman Prize for Innovation at the Masterworks Museum of Bermuda Art. In 2013, she shared the City of Hamilton’s Art Festival Competition prize with fellow artist Milton Hill. Her installation, When the Bough Breaks, featured in the 2016 Bermuda Biennial at Bermuda National Gallery, was chosen by the Textile Museum of Canada to represent Bermuda at the 2015 Pan Am Games.